On Friday night of the Athena Film Festival (2/23/18), people were lined up a block from Miller Theater to try to get last-minute tickets to see Lady Bird. “Tell me if Greta Gerwig comes!! !” one friend texted me. I promised her I would, though judging by the pre-screening excitement, I didn’t see how she was going to slip in for a Q&A. 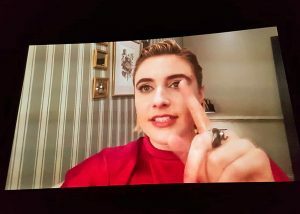 My sister, who was sitting a few rows away with her fellow Barnard friends, had heard that the filmmaker was going to come for sure, “I mean, why wouldn’t she? 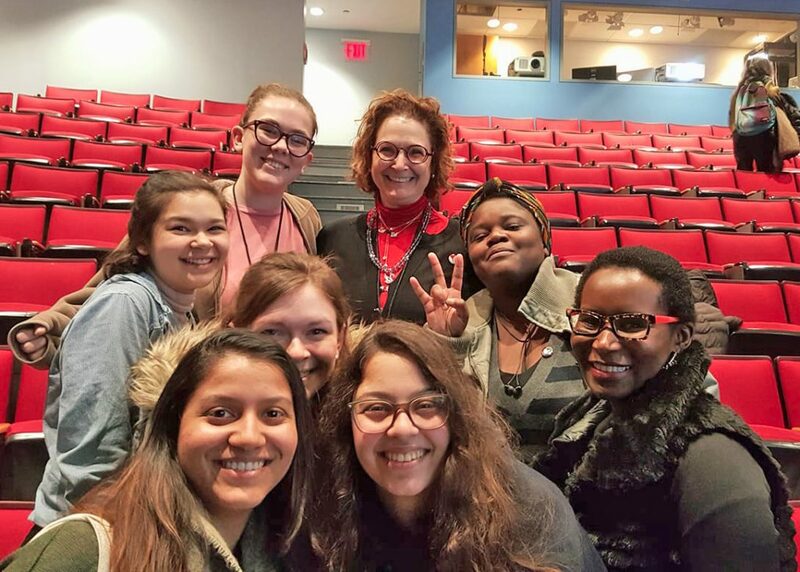 It’s her alma mater, and they’re showing it right in New York!” The Athena leader announced almost immediately after everyone had sat down that Ms. Gerwig couldn’t make it, but that she had left us a message. In a clip shot most likely on her iPhone, Greta Gerwig greeted Barnard and said she was so excited that a place so significant to her was celebrating her movie. I remember reading an article soon after Oscar nominations came out about how ecstatic she was, how she couldn’t stop crying with joy and calling her cast and crewmembers to share in it, how this was going to be her first time actually attending the Oscars. In her iPhone message, she was grinning almost feverishly, apparently getting ready for an Oscar party. When the movie began to play, I felt overwhelmingly warm and encouraged seeing it for the second time. The shining success of Lady Bird was humanized. I felt like I could appreciate it not as some silver screen thing the skies had deigned to let me witness, but as a piece of art made carefully by a person as real as me. Next day, I saw The Breadwinner, directed by Nora Twomey, based on a book by Deborah Ellis. It’s a story about Parvana (voiced by Saara Chaudry), an 11-year-old girl who dresses as a boy to help save her family when her father is imprisoned by the Taliban. It’s a story about Parvana’s incredible courage, of course, but it’s also about her ability to comfort herself and her family through storytelling, and about the extraordinary pain and depth of her own family’s story under a regime that seeks to erase it. My favorite moments were those shared between Parvana and her friend Shauzia (voiced by Soma Chhaya). They have given themselves boys names which mean “fire” and brave,” and they run freely through the city, laughing and giggling and eating. “When you’re a boy, you can go anywhere you like!” Shauzia says to Parvana. When Parvana first tries to order food and finds how easy it is when she looks like a boy, the joy on Parvana’s face is as poignant in animation as it would be in live action. Dalya’s Other Country is a documentary film about Dalya and her mother, who escaped from Aleppo and moved to LA in 2013. As with The Breadwinner, Dalya’s Other Country’s filmmaker lets us see the full extent of Dalya’s personality, and it’s these moments that provide us with the human in the nearly unimaginable difficulty of the larger situation. I remember that when I saw Human Flow, Ai Wei Wei’s expansive documentary about migrants and refugees, I was particularly struck by an interview with a child who was living indefinitely in a refugee camp in Berlin. She said she wished she could just go outside, or play with her friends. “People forget that sometimes when you’re living in a terrible situation, it’s not always violence or overt suffering. Being a refugee is sometimes just so boring,” a friend of mine commented after she saw the movie. In the Q&A afterward, audience members were particularly interested in Dalya’s mother, Rudayna, who expressed throughout the film about how isolated she felt in LA, and how disappointed she was with her husband’s decision to take a second wife without her consent. Her son and Dalya’s brother, Mustafa, who was featured in the movie and who worked as a liaison between film crew and subject family, was present at the Q&A to give us some good news: Rudayna found the Syrians in LA, and now she’s constantly driving around to her various different community groups. She even leads an outreach group that encourages girls to go to college. “She’s a very, very social person,” he said, and everyone laughed. In a Q&A after The Divine Order (conducted by FF2 Media's very own Jan Lisa Huttner! ), writer and director Petra Biondina Volpe talked about how meticulously she had crafted the details of the small 1970s Swiss town that served as the setting for her human rights story. She explained that she wanted to show just how subtle and pervasive were the social obstacles that prevented women from speaking out. To me, that is The Divine Order’s success: Volpe portrays how the women in the town could be shamed for neglecting their children, and how their husbands threatened and taunted each other for the “emasculation” of having outspoken wives. Like many of the other Athena movies, The Divine Order also highlights friendship and laughter, and it was thoroughly enjoyable. At the Athena Film Festival two years ago, I met Jan for the first time to see Radical Grace before we got lunch and she told me about the FF2 Media mission. Nervously, over the next few days, I wrote my first review for The Hot Pink Pen. This year, my second time at Athena with FF2 Media (after a year spent at Cambridge University), I loved the excitement of going with our growing team, and the general camaraderie of the people in the audience, often with the filmmakers themselves present at the screenings. For a long time still, I’ll be thinking especially about The Breadwinner, and the family that manages to come back together. Director Nora Twomey mentioned in her interview with FF2 Media’s Senior Contributor Lesley Coffin that it was impossible to do research on exactly what Kabul looked like in 2000, since so much of it had been destroyed and never documented, but that the animators had brought in an American-Afghan artist who could provide some expertise. I love that a team of artists could visually rebuild a city from cultural and personal memory. Featured Photo: The Breadwinner's "Parvana" (voiced by Saara Chaudry) and her father, "Nurullah" (voiced by Ali Badshah). Photo Credits: Gkids. 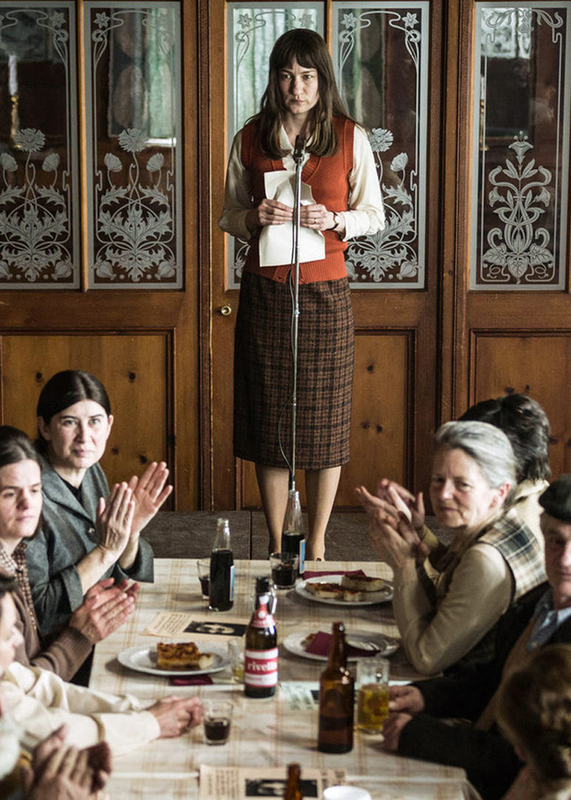 Top Photo: The Divine Order's Marie Leuenberger as "Nora." Photo Credits: Zeitgeist Films. Bottom Photo: Members of the FF2 Media team after the Q&A on Sunday. Photo Credits: Richard Bayard Miller (2/25/17).